Xerox 3117 Phaser has a problem when a paper is automatically loaded for printing it gets stuck half way through and then you need to pull it out physically. 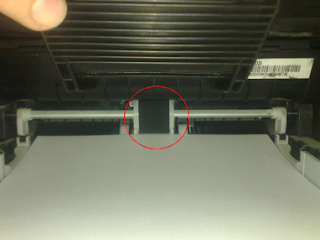 I found a solution for this (heard it from an experienced printer servicing person), you need to take a strong tissue that doesn't tear easily (like baby wipes) and clean the the feeding roller (see pic below) and the rectangle below it (in the picture below the rectangle is under the pages) with some acetone or alcohol. This worked like a charm for me ! You have to repeat the process every month or two. And another good advice is always to have at least 15 pages in the feeder and not less - it helps loading the sheets. They are pretty much the same and I can't find any special affinity to either one.